I know it is a catch 22 for Halloween decorating. Some of my readers are empty nesters now and no longer get into it like they used to. Some are still kids at heart and love it....so you never know. Because I have two boys, I still get into it. There will be NO Halloween parties this year at our house, however, there will still be some decorating. Let me show you some inspiration I have found, and some things I just may try to create. I noticed this year at Michael's Martha Stewart has expanded her line of crafts and decor, these lables or similar ones she features. Simple lampshade embellishments and some dollar tree skulls. Our front porch was my favorite last year...not sure what I will come up with this Halloween. I even made a fun Halloween wreath last year. Hope I gave you some inspiring fun new ideas. Even if you don't decorate for Halloween, perhaps you will throw in a few spiders and skeletons this year. go to the Dollar tree! As always thanks for taking the time to come by and chat it up with me! cute idea. I don't get into Halloween at all,. But I do put a few things out for our grandchildren to enjoy, Hugs and wishes for a joy filled weekend. I normally decorate for Halloween but I'm not feeling it this year. It may have something to do with 90+ degree weather & having to go in the attic to get the stuff down!! Have a great weekend! You do go all out, and do a great job of it also. I have never really gotten into decorating for Halloween. Have a couple of little things I put out if the grands are coming (if I remember), but that is it. These are some great ideas, can't wait to start my Halloween decorating, my little house is just waiting to be transformed by my favorite holiday. I'm an empty nester, but I still put out a few things for Halloween. Love your door from last year. Cute post! I do decorate for Halloween, but may not have much time this year. I forgot about your feet by the front door. I loved your feet! I am decorating this year, but I may wait until October 1st. I'm just now getting my generic fall stuff out for decorating. Cute samples Ded.. fun to look at but I've never decorated for Halloween.. I still love Martha's mice on a bookcase from last year. too cute. Oh Debbie!! Thank you ! I'm so excited ! Can you tell?Chrome Google is wonderful.I should have asked a younger blogger a long time ago. LOVE THE DECOR. ESPECIALLY THE BAT TREE AND THE WREATH! Have an awesome weekend YALL! We do decorate here, Debbie! More in a fall theme and less on a scary Halloween look. I used to put out all the pumpkins and corn stalks and mums and on the 31st I would add a dozen creepy black crows to the look, but then I got labs and they somehow felt compelled to take down the birds and devour them!!!! Needless to say... we constantly have to alter our decor to accommodate the canines!!! I do a light Halloween decorating along with the rest of my Fall decor. I have adult children, but we still all enjoy a reason for celebration. I've done three post of Fall and Halloween decor and plan on another next week. Too much--I don't think so. Love all the candy canisters and labels. I try not to do anything Halloween that mimics Christmas decor--just my preference. We are empty nesters and I think I go even more overboard with Fall decorating than I used to when the kids were growing up. It's right up there with Christmas for me! I like the spiders on your lamp Debbie. You do a great job of decorating for Halloween. I've never really done it because I don't have kids and stopped accepting trick or treaters when we got mainly teenagers coming by. Wouldn't have been so bad except they come back later to steal and vandalize. That's not so fun. This is the first year I've decorated for Halloween in years, even though I always put out stuff for Fall and Thanksgiving. Now I'm all over decorating for Halloween ~ so fun! Just me here but hey, I love it and when company comes, they are usually surprised. We love decorating for Halloween, although I usually don't drag the Halloween tubs out til October. I try to stay with neutral fall decorating until then. Terrific inspiration pics! Thanks for sharing. I love all these Halloween ideas. Even though we are empty nesters, we have the wee grands to entertain. Yes I always decorate for Halloween. My youngest is 10 and he goes trick or treating. I usually decorate for Halloween on just the outside of my house though. Your front porch decorations from last year look great. I'm always looking for new ideas. I like to change it up so it doesn't get boring. I do not decorate much for Halloween because I always decorate for the kids birthdays, and my oldest daughter's birthday is in late October. I like the caution tape and the skulls on the chargers you used last year, LOL. I just thought of something...daughter is away @ college this year *sadface* but now what do I do??? Used to do a lot of Halloween decorating, but now I just do some Fall inspired things for the fireplace mantles, foyer, bookcases, and front door. I loved all the adorable and "creepy" things you did last year, so I can't wait to see what you do this year. We had two, yes I said two, real live bats invade our family room a couple weeks ago-not fun at all! Hubby got them with a tennis racket. Oh my, it was awful, and I was hysterical, yuk! Have fun, and I know you'll come up with some great ideas. Hi Deb, Really cute ideas. We do lots Halloween decorating over here. Just pulled out the ghosts, witches and goblins today! I'm guilty of the kids all grown up so why do it. But I always have love the decorations of Halloween I think the most. They bring out the kid in me. Oh man, now you got me wanting to decorate for Halloween right now! At 10:15 PM! I feel like dragging boxes down from the attic. Do you think anyone will notice? We decorate a tone around here but I think I am going to thin out the bins this year and get rid of some of the older stuff. Love your ideas and especially your table. Yes, yes, yes! 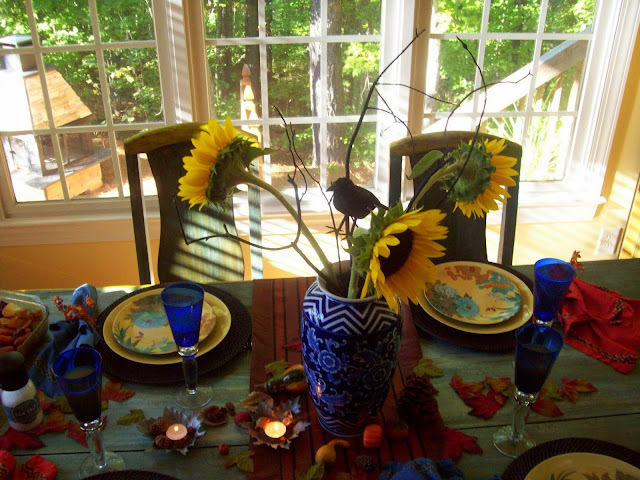 I kind of throw in Fall & Halloween together & as soon as Halloween is over, I add my Thanksgiving items. 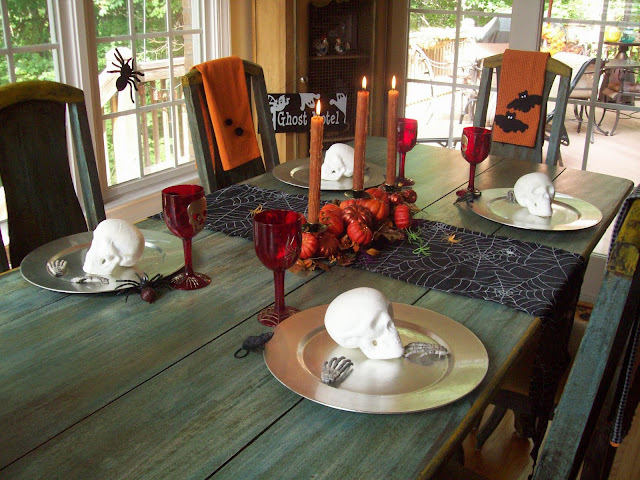 Your decor is so fun & I really like the skeletons, etc., but I tend to stay away from the "creepy & crawly" stuff.....not quite my style, lol! I've kind of gone "overboard" on the Fall/Halloween decor, but wait, is that possible? Anyway, I've done a lot this year because of the "Grands" being so close. Who knows, I may HAVE to do some of the "creepies!" Sooooo- cute! I love your Fall and Halloween decorations! Thank you for such an inspiring post!